Well, I went ahead and ordered a GEM for wide field shooting. Since Meade doesn't make an entry level GOTO GEM mount, I opted for the iOptron Smart EQ Pro 3200. All the reviews were mixed about it but I thought I would give it a shot. 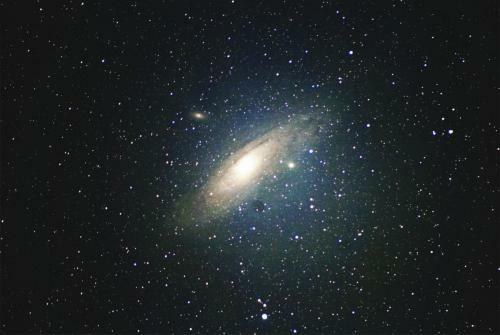 After setting it up and doing a quick polar alignment, I set the Canon T5 on it and slewed to M31 and started tracking. I choose M31 because the moon was at 96% Tuesday night so I needed something bright. I took 91 shots at ISO 800 that were 60 seconds each. Any longer exposures began to be washed out by moonlight. Star trails was very minimal which means Deep Sky Stacker was able to stack all 91 shots. I was very pleased with the performance of this little drive. I am looking forward to the next opportunity under dark skies to see how long this thing will track without star trails. Looks great to me. You sure cannot tell that the Moon was that full in the picture. Thanks guys. I am still nowhere near the quality that Mark Sibole is at but it is a learning curve and I am enjoying the heck out of it! My wife is getting more into it especially after the eclipse. She even said I ought to build an observatory! I 'bout fell out! Take her up on it before she changes here mind! Already started drawing up plans!